Should Indians have more control over their land? Native American lands contain $1.5 trillion in untapped coal, oil and other energy resources. The potential bounty is raising hopes among many Indians that energy development can help tribes reduce poverty on their reservations, where unemployment averages 19 percent. But development also is raising fears that it will threaten Indians' traditional way of life and harm the Earth. 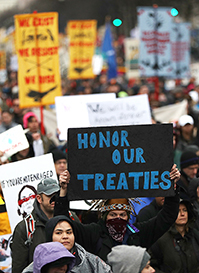 In addition, the dispute is raising tough questions among Indians, lawmakers and others about energy development and the limits of tribal sovereignty. The Navajo and like-minded tribes want federal regulations relaxed so Indians can develop their energy resources, providing jobs and other benefits. But other tribes argue the federal government remains obligated under treaties to protect Indian land from commercial exploitation. They are further worried about the Trump administration as it relaxes regulations on the energy industry and federal lands. Meanwhile, controversy has arisen over some tribes' disenrolling of members. Critics say the practice is a power grab by tribal leaders, but defenders say tribes have a right to decide who is a member.